Daveswordsofwisdom.com: If Roses Grow In heaven. If Roses Grow In heaven. Absolutely beautiful. I lost my little sister and this poem explains exactly how I feel now. Thanks for posting this. For my Mom, 18 yrs ago today. For my beautiful loving mother. November 17th will be two years since God took her home with him. I miss her as much today as I did when she left this world. The pain never stops hurting. I love you my beautiful mother my forever angel. We lost my mom less than a week ago. This is perfect. 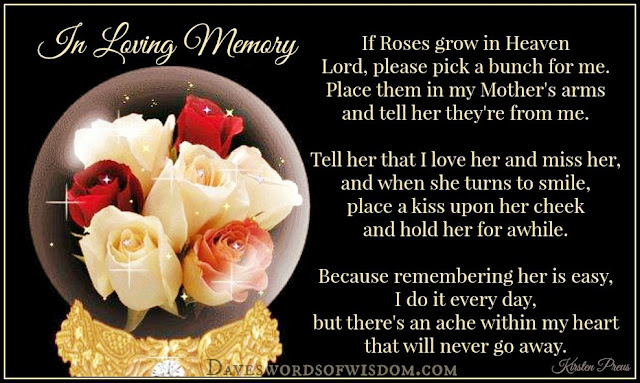 For my mom, she was taken by the Lord and brought to heaven to receive eternal grace and salvation. We had difficult struggles during the early years but managed to get through because of your endless sacrifice. Thank you Mommy for giving us the best of everything in your own humble way.